While I was working at the Food Mart on Prater a huge new store opened across the street to the east called “Safeway”, today it is PEP Boys auto parts. I transferred to the new Food Mart they had on Kietzkie and Vassar which later sold to Washoe Markets who eventually consolidated and closed it running their last Washoe Market at 1251 South Virginia (now an antique store). I left for Vietnam in 1966 and when I returned Bob and John Games immediately hired me back where I eventually became assistant manager and then manager for that store until just before it closed. Our phone orders were a high priority and I made many trips delivering groceries in the early to mid 1970’s. I have many great memories about the bakery and meat market at Washoe Market, truly a customer friendly and family store where we would order any item for you if we didn’t stock it. The butchers were celebrities behind the counter. I eventually used my GI Bill to get a degree in wildlife management and became a game warden captain with the Nevada Dept of Wildlife and retired in 2009 after 28 years. Please feel free to use any of the information above, edit it as you see fit. Didn’t have to edit a thing, Fred! And I’m reminded by the daughter of my favorite third-grade teacher, who was Mrs. Conrad in 1949 at Mary S. Doten Elementary, whose daughter’s name is Carolyn Darney. Carolyn phones, because Carolyn will buy a computer and start e-mailing when pigs fly, that Brickie Hansen’s sister (Brickie owned Hansen’s Market, mentioned in the column) became the wife of Reno mayor Tank Smith. Where else would you get information like that, I ask??? > as a student at Reno High. “We certainly enjoy reading your column. The recent article, “What Goes Into an (Alma Mater’s) Name?” was especially interesting to me and my husband, Guy Morris. Guy’s mom, Betty Morris, was my much beloved mother-in-law, and we have always hoped that a school would be named after her. Guy and I both taught in the Washoe County School District for over 31 years, and yet we do not know the procedure for the naming of new schools. If you have any information or know how we can spearhead a movement to get a school named after Betty, we would appreciate that information. Guy worked as a school counselor at several middle schools in the district, retiring from Traner Middle School. I taught at Orvis Ring for one year, moved to Vaughn Middle School for five years, and then retired from Reno High School after 26 years as the head librarian. Two of our sons graduated from Reno High and we also find it annoying to see Huskie spelled Husky. Thank you for clarifying that in your article. Guy and I have only the best memories of growing up in Reno, attending local schools, and graduating from the University of Nevada where we were active in ATΩ and Kappa Alpha Theta. Here now, Nancy Mull. 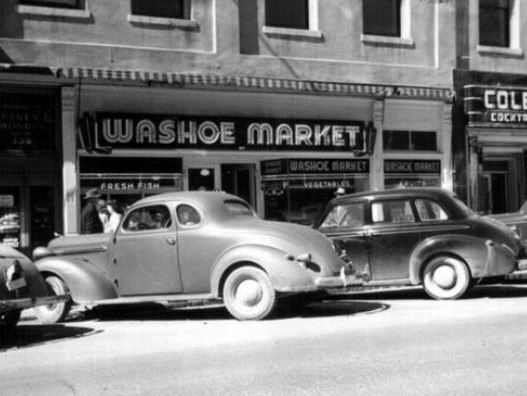 Nancy refers to a Washoe Market on Wells Avenue that I’m trying to find. Thanks, Nancy! I’ve been enjoying reading and reminiscing about the old little grocery stores in Reno. My mother worked for Mr. Churchill at his store so it was a kick to see it mentioned. As I recall, the store was narrow and had a wooden floor. 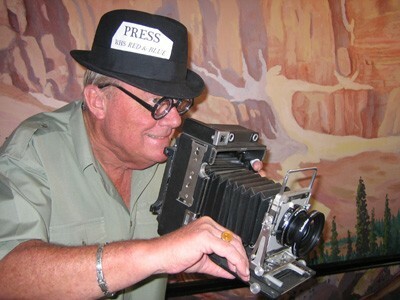 Very old-fashioned. Fresh produce. She also worked at the California Market on North Virginia Street. It was on the west side, close-ish to 4th Street, right downtown. Southworth’s was a short distance south. There was a butcher shop in the back and I may be wrong, but I think it was run or owned by a Jolly of Butcher Boy fame. This was in the 50’s when a kid could wander around downtown safely. We lived on West St. across from Central Junior High (maybe it was Reno High then), next door to the Jewish synagogue. Another grocery store she worked in was the Washoe Market on Wells Avenue. What a cool stroll down memory lane. Thanks! The Eagle Thrifty grocery store was across the street from the store where my mother worked. It was in the building across the alley from what is now Lucke’s Saloon. More e-mails may be added, if such arrive, if I get permission to use, and if they don’t rip me too badly for omitting a market. Which I did – sorry, it’s a space thing. Karl, let us not forget that hole in the wall grocery store on W.4th street that we went to for snacks at the old Reno High School.